One week behind schedule for Camp Nanowrimo, I have finally completed a first draft novel, tentatively titled Red Soil Through Our Fingers! This is a major milestone for me. I’ve tried many times, via Nanowrimo and otherwise, to finish even one draft of a novel, but have never made it through the “murky middle”. Having made it to the other side, wow. It really does get better after roughly the 80% mark. Here’s what it means for what I’ve got and where it’s going. I’ve tried several of the minimalist word processors out there. For Windows only, I’d say Q10 is my favorite — clean, simple, and fast. However, I’ve been on the go a lot and find myself using all three major platforms (Windows, MacOS, and Linux) during the course of a typical day. If I want to sneak in a bit of writing at any moment, a cross-platform solution has turned into a must. I also realized that I do miss certain features that many “minimalist” word processors might consider extravagant. I’ve fallen in love with FocusWriter for drafting new stories. It is not only cross-platform, but comes with a greater degree of control over the writing environment, without sacrificing the simple and clean approach to the writing itself. Put a different way, it’s actually not minimalist — it has everything that a fiction writer would want, and simply nothing more. Features: full-screen mode, instant word count, daily targets, session timers, scene dividers, and customizable themes. The background is a shot from one of the Mars orbiters, with blue-grey Georgia 16pt on 85% opacity black in the center. Ping me if you want the theme file. I’m back from a very refreshing week in Vermont and Maine, the latter with other writers (and a lot of fried clams and beer on the beach). Compared to the day to day survival stance that first-year teaching forces on the mind, how I feel now is nothing short of fantastic. I’m ready for a summer of writing. I had a chance to parse through and reflect on the year or so of work I’ve put into Vihara, the novel I had in progress. I realized that I’m trying to say too much with it. I had at least three major premises: 1) the sociopolitical consequences of corporate control of space, 2) the idea of what Buddhism looks like in a spacefaring society, and 3) an exploration of quantum graphity as a cosmological theory. In other words, there isn’t really any one particular thing that Vihara was about, just an overlay of ideas that I find interesting. That doesn’t mean that the work was wasted — it helped me think through these ideas and the characters. So a few things are happening. I pulled out the first layer and refined it: What happens to ordinary people if a weak public space policy allows corporations to run the show in space colonization? Then I “zoomed in” within the Vihara worldspace and fleshed out one particular location: a Mars colony situated near the Hellas Planitia. I defined three new main characters (using a cool new method I’ll talk about in a later post), and feel like I am in a good position to make a character-driven (as opposed to world-driven) story. Finally, to give myself some fun motivation, I’ve signed up for the Camp Nanowrimo summer writing challenge with my writer friend Brian. We’re both aiming for a 50,000-word rough draft by the end of July. 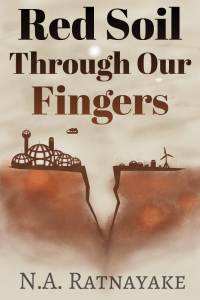 Working title: Red Soil Through His Fingers. 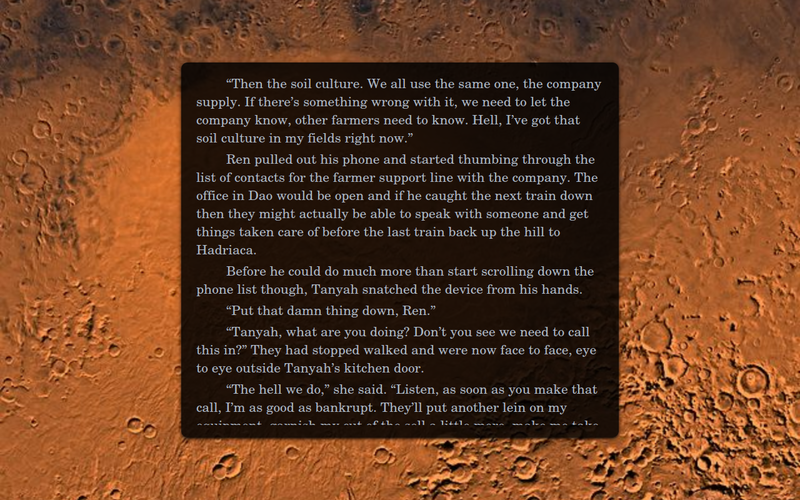 An interplanetary homesteader accepts a deal with a Mars colonization company to start a new life on humanity’s bold new frontier in the solar system. But staunch idealism turns to unease when the fine print becomes more than it seems. To what lengths will a private corporation go in the balance between human lives and profit? An exploration of the consequences of weak public space policy during this, our dawn of the private space age. I’ll put up a widget or something to help track progress.